February is Black History Month, and it couldn’t have come any sooner for your local chapter of EcoWomen. We are at a crossroads in Washington D.C., and the nation. Challenges for women in the environment are compounded by a hyper local tightening of political tensions, regulatory rollbacks, revised—and frankly regressive—policy decisions. What better time is there to engage in a month-long reflection on the contributions, struggles, and textures of American life through the lens of black people? I live my life through this lens, and as a leader, engaging the environmental sector on access, equity and justice, I am a lifelong student of the past, with my eyes trained on the present. History is in the making. So where are the heroes in technicolor? Here, here, here and here, for a start. They are everywhere. And I suspect that they always were. The future looks bright for environmental organizations taking this culture correction to heart, as leadership and membership shifts to closer approximate the population, and include diverse access points and perspectives. It is a great time to consider the unnatural paucity of milestones and connect the dots on the homogeneity of voices that have shaped the narratives, and ask, to what end? As the DC chapter of EcoWomen looks forward to its fifteenth year, we are wrestling with questions of our existence as a body, our presence in the District, and whether or not we are walking the walk on equity and inclusion beyond the benchmarks of diversity. Operationally, this means taking a look at the depth of our bench in programs centered around inclusivity of women of different ages, capacities, and stages of life. It also means we are examining who we choose to lead our panels and programs—including our monthly EcoHour speakers—and whether or not our choices reflect a bias towards any branch, specialty, or perspective on environmental issues. We are taking up the challenge of articulating our aspirations and charting their emergence in internal and external policies. We are reviewing our goals, mission, and programs with the awareness of heteronormative, gender based, and age targeted assumptions. We begin by making no presumption that we are doing it “right” or that we can exist as DC EcoWomen in community without some careful thought about who is in the rooms where decisions are made. As we move through these considerations we plan to open the questions up to our membership—you! So, be on the lookout for opportunities for feedback including surveys, focus groups, or polls where we will request your input on how you might like to see us express our desire for a representative chapter on the way to meaning well and doing it too. We expect that after some thought we will articulate policies about how and why we work and any action plans that would allow us to make it a matter of praxis. 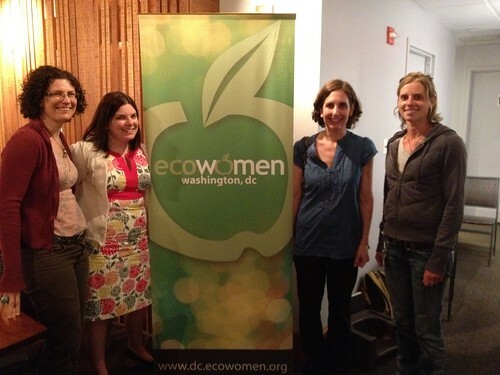 Thank you, as always, for your membership and continued support of DC EcoWomen. A condo building is going up in my neighborhood, and my husband and I were worried it might cause more traffic congestion. We already live by a highway, and I’ve read that can increase the risk of high blood pressure. But then I read the world is going to house 9.6 billion people by the time my baby daughter is thirty, and the condo suddenly seems like a very minor concern. Already, one in nine of us—or about 13 percent of people worldwide—don’t have enough to eat. That’s not fair. I like food. You like food. We should all have enough of it. As a dietitian (and a human), I’m perplexed – how are we going to feed the 3 billion more people that will share our space with us? We’ll have even less resources by then. Food production would need to increase 70 percent to feed all our new friends. Globally, producing food already eats up 70 percent of fresh water and causes 80 percent of total deforestation. Ten billion acres of land across the globe – an amount the size of Africa – is being used to raise livestock. We can’t increase our global food production ? we don’t have the space. Instead, we need to drastically change how we grow, produce, and eat food. The most powerful thing we can do as individual consumers is to eat sustainably. To feed our 3 billion new friends, we need to be food secure. Food security is when we have enough safe, nutritious food. A sustainable dietary pattern has minimal environmental impact but maintains food security and nutritional value. A “dietary pattern” is essentially the way we normally eat. It includes our typical portions, combination of commonly eaten foods, and the variety in our habitual choices. To be sustainable, a dietary pattern should be healthy, shouldn’t decrease the biodiversity of an ecosystem, should be economically sound, and should optimize our resources. Plant based diets such as the Mediterranean Diet, the DASH (Dietary Approaches to Stop Hypertension), and a vegetarian (or vegan) diet seem to fit this bill. Health benefits of these diets include lower risk of heart disease, cancer, and diabetes, and they boast a lower amount of red meat, processed foods, and more fruits and vegetables. Studies are repeatedly finding that diets high in animal foods are not sustainable. Beef, in particular, uses a lot of resources and produces too much waste. In one Italian study, beef was the food tied to the greatest negative impact on the ecosystem while a vegan diet had the lowest environmental impact and greatest health score. Beef and lamb require the most fossil fuel per calorie of protein ? 250 times more than beans! Overall, agriculture is responsible for 30 percent of greenhouse gas (GHG) emissions, but 18 percent of this is due to raising livestock. That’s more than the transportation industry and all industrial processes combined – they only emit fourteen percent. Another issue is that meat increases per capita land requirements while feeding less people overall. The grain we feed animals doesn’t go as far as it would if we just were to feed it directly to people, and we feed 40 percent of grain globally to livestock instead of our hungry 1 billion human friends. Meat also produces a large amount of waste – methane and other gases as well as solid waste that pollutes land and waterways. A plant-based diet with a smaller amount of meat is making more sense. Harvard and the European Union have both looked at sustainability research to develop diets. Harvard’s plate boasts more fruits and vegetables than USDA’s MyPlate, more whole grains, and focuses more on plant protein while limiting red meat intake. It also encourages milk and dairy no more than 1 to 2 times a day. The European Union’s LiveWell for LIFE diet has been found to reduce GHG production by 25 percent compared to current intake. It too promotes a plant-based diet with a focus on more plant proteins than a typical person eats with no more than 1/3 of the diet consisting of foods from animal sources. Currently, we are not eating in line with either of these diets. Most of us eat a Western-style diet that’s high in red meat, dairy, and processed foods (think packages, boxes, bags, and the center of the grocery). We include few fruits and vegetables, limited legumes and beans, and not enough whole grains. We especially love our red meat. In 2009, we ate 14 million tons of beef ? about 92 lbs. per person. By 2030, this number is projected to increase to 17 million tons. The average man only needs 56 gm of protein per day, but he eats over 100 gm daily! Demand is also increasing worldwide as countries become more industrialized. First, we can shop locally. This limits GHG produced by the transportation of food from far away. Eating more fresh fruits and vegetables is also a smart choice, and not just for health reasons. Consumerism is powerful. We need to show our government that sustainable farming practices that maintain the soil are demanded. We can also limit ourselves to our fair share, because excessive energy intake requires more energy use. We can also shop for fresh food to decrease waste from packaged goods. Also, we throw away 40 percent of our food. Eating more mindfully would help decrease this amount and preserve our vital resources. And finally, eat less animal products. If just 10 percent of us limited consumption of animal products, enough food would be saved to feed 1 billion people. From a nutritional perspective, limiting meat would only promote positive health. We don’t all have to abstain and become vegans, but research shows any decrease in meat consumption increases sustainability AND improves decreases disease risk. I like to call a plant-based diet a gracious diet. Include small amounts of meat if you like, but let’s remember to conserve. We can get everything we need while still being considerate of future generations. They’ll be hungry, too. “Like” Social Media? Then Tweet your Professional Brand! posted by dc ecowomen | on connection, DC, EcoWomen, environmental, facebook, green, jobs, linkedin, Professional, recycle, social media, twitter, Washington DC, women | Comments Off on “Like” Social Media? Then Tweet your Professional Brand! In the Gen Y era, social media is as ubiquitous in our professional lives as it is in our personal lives. Most of us remember the beginning of social media as Friendster and MySpace, then Facebook came along and changed the game. I remember my freshman year of college and the buzz on campus was a semester long campaign to have Facebook host our tiny liberal arts university. Ah the glory, finally we were able to connect with our old friends from high school studying at schools near and far, share our photos, give props to our friends, and attempt to boost our social status by our frequent and measured activity online. Now this life-sharing and communication concept has made its way to new platforms with the likes of Twitter, LinkedIn, Fourquare and many more. These social media platforms when utilized correctly can lend more than a place for social bragging rights but a place to advertise with purpose and to sell yourself! If you are looking for a new job, social media can be a great way to brand yourself and let potential employers know about your skills and experience. The most popular platforms are Twitter, LinkedIn, and Facebook. The first principle rule social media gurus stress is do not put anything out on the Internet that you wouldn’t want your coworkers, grandma, or anyone else who’s opinion you value, to see. The Facebook college days are over and if you are out of school and developing a career then who you are has to or is starting to evolve, so take care to update your information. Use a current photo, update your “about me” info to include education and other relevant information, and don’t be afraid to display your personality. It is common for professionals to feel that their “work” lives and “real” lives are separate and should remain that way. However, who you are is who you are, you bring that to work everyday and your interest and hobbies are valuable ways to show you’re a real person and deepen connections. Stay tuned for more professional tips and information on using social media to your advantage!